We have seen many concepts, but this is the most realistic plan yet for humanity's first Moon Base. 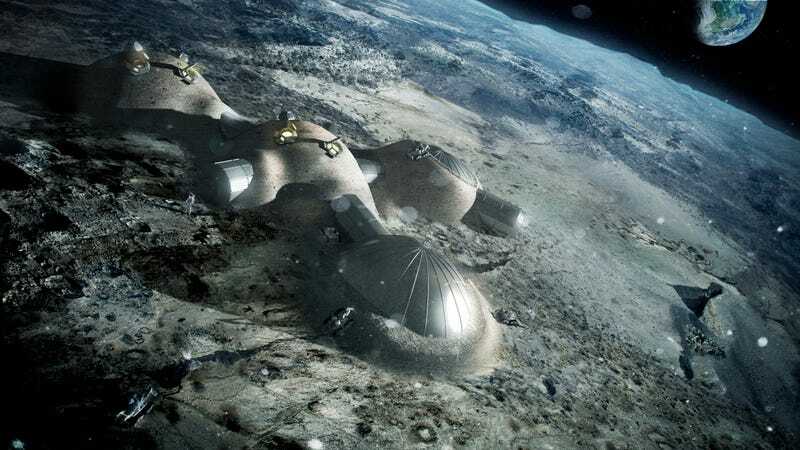 It will be more efficient and cheaper to build than any other alternative, as it uses 3D printing to quickly transform raw lunar soil into habitable domes. The lunar soil structure will provide both radiation and temperature insulation. Inside, a lightweight pressurized inflatable with the same dome shape will be the living environment for the first human Moon settlers. The European Space Agency and architectural firm Foster + Partners are now working on the technology to make this a reality. According to ESA's human spaceflight team's Scott Hovland: "3D printing offers a potential means of facilitating lunar settlement with reduced logistics from Earth." The logic is that if 90% of the stuff we need to build the base is already on the Moon, we only have to ferry the 3D printing robots (you can look at one below) and the lightweight parts, like the inflatables and the solid connector and entry segments. This will make this idea a lot cheaper than the alternatives. As a practice, we are used to designing for extreme climates on Earth and exploiting the environmental benefits of using local, sustainable materials. Our lunar habitation follows a similar logic. That block is all built with simulated lunar material and magnesium oxide. That turns the moonstuff into a pulp that can be sprayed to form the block. Then, they apply a binding salt that "converts [this] material into a stone-like solid." Quite impressive. According to Enrico Dini—the founder of UK-based Monolite, who started to work on 3D building printers back in 2010 and proposed them for lunar base construction—the machines are now printing at 6.5 feet (2 meters) per hour. He says that their next generation will speed up to 11.5 feet (3.5 meters) per hour, which is enough to complete an entire building in one week.